When you're dorm room shopping for dorm essentials on your college dorm checklist, you want dorm items that are versatile. Christmas lights aren't only for Christmas trees, and they are the versatile dorm items you are looking for! These dorm essentials aren't just great for decorating dorm Christmas trees. These dorm necessities are also great for dorm room decorating the perimeter of your college dorm room! Our 18' Clear Rope Light features a neutral color that go with any holiday decorations or other dorm room decorations you have planned for your college dorm room. 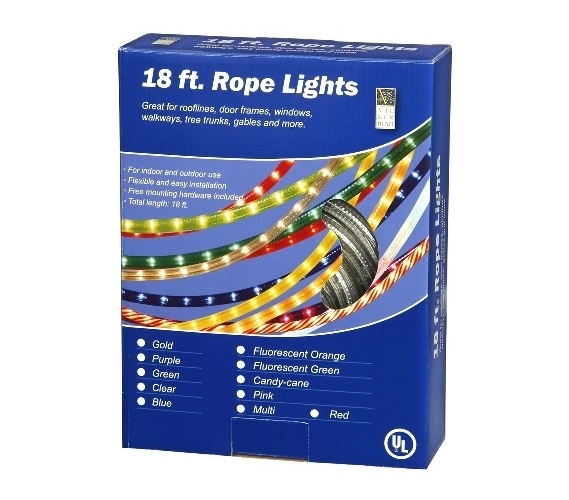 Our 18' Clear Rope Light features white bulbs with 1 inch spacing so you will have plenty of dorm lighting in your college dorm room decorations. Wrap this dorm necessities item around your dorm Christmas tree for your holiday decorations. Or you can even wrap it around your dorm room walls for both extra dorm lighting and extra style in your dorm room decor. Plus, since these are Christmas light strands, you don't have to just keep them in one spot or in a line around your dorm room. You can even get creative and make designs right on your college dorm room walls!